The magazine’s Winter 2019 issue focuses on leading retailers. 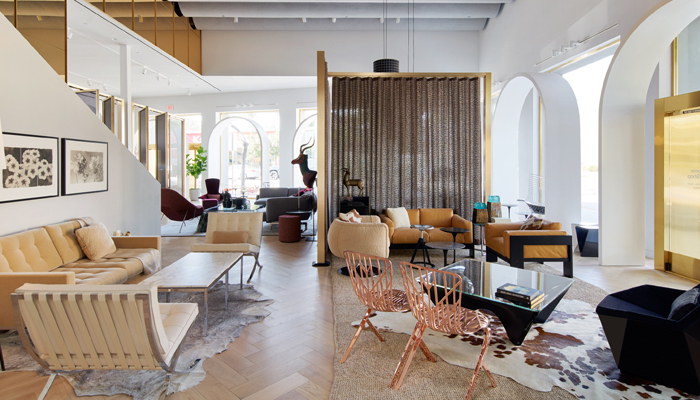 The Knoll Los Angeles Home Design Shop opened its doors in February 2018, reimagining modern living for West Coast residential interiors. A destination for interior designers and design enthusiasts, the shop features furniture by designers across the Knoll spectrum – Eero Saarinen, David Adjaye, Mies van der Rohe, Joe D’Urso and more – capturing the spirit of total design pioneered by Florence Knoll. “When you work on retail projects, you have to figure out how to get someone’s attention in a fairly short time,” Remelt tells Business of Home. Inspired by former Knoll President Yves Vidal’s York Castle in Tangier, Morocco, the Knoll Los Angeles Home Design Shop, with architecture by Mark Lee, does just this. O’Shea-Evans highlights features across the Knoll constellation of brands, including a brass iteration of the Rockwell Unscripted Creative Wall and draped FilzFelt ceiling panels.